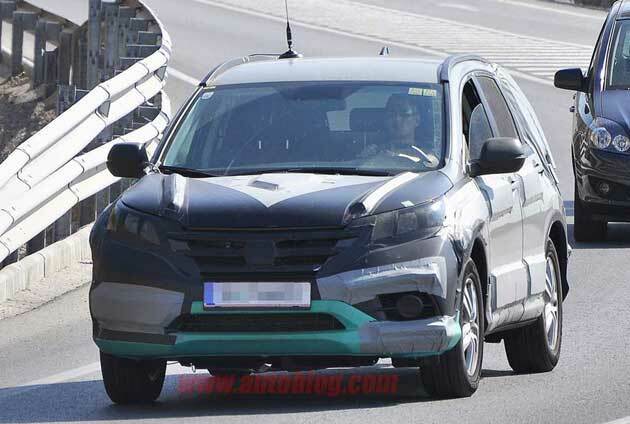 We've already gotten a fairly clear look at the next-generation Honda CR-V thanks to a few leaked patent drawings and the unveiling of the CR-V Concept, but our friendly neighborhood spy photographer managed to snap a few photos of the real deal out and about in the South of France for a little testing. We can clearly see the more stylized nose, complete with its swept front fascia and broad three-bar grille. While the extensive cladding does a smart job of hiding the D-pillar from prying eyes, it's easy to imagine the redesigned look of the roof structure from the patent sketches. Don't expect to see much in the way of revolutionary engine options when the production model gets a full-unveil at the LA Auto Show. The same 2.4-liter four-cylinder is said to stick around for next year, mated to a new six-speed automatic gearbox.